As humans we seem to have an insatiable need to document life — our actions, the actions of other species of animals, anything and everything around us. While the ever present, universally accessible nature of the camera in the modern world makes this all too easy, the drive to produce a permanent record of life’s meaningful — and not so meaningful — events is not at all a concept borne of recent technological achievement. Consider, for example, cave paintings dating back to 40,000 years ago, commonly depicting scenes involving wild animals and outlines of human hands. And you only have to go back to about the 4th and 5th centuries BCE to realize that the great ancient Chinese and Greek minds had already grasped the basic principles of optics and were quite familiar with the pinhole camera, or camera obscura. Unbeknownst to the ancients, their simple device would eventually give rise to what is arguably the single most compelling means of documenting our lives — photography. What follows is a list of 12 events (out of, perhaps, thousands) that mark the technological, social, and cultural path of photography's evolution. 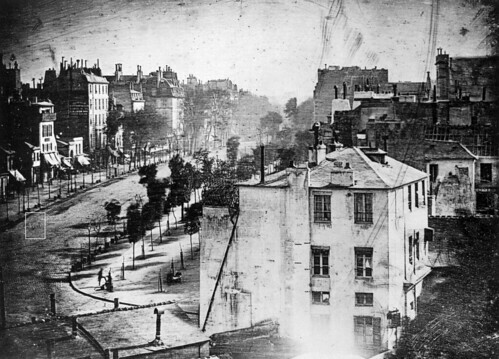 Louis Daguerre and the Daguerreotype – In 1829 French painter and physicist Louis Daguerre partnered with Niépce in an effort to reduce the excessive exposure time needed to render an image. 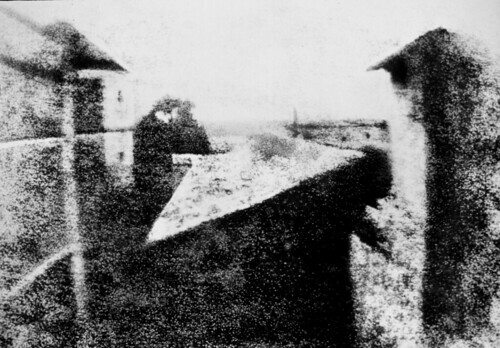 Niépce died in 1833, but Daguerre continued the work and eventually developed a more effective method; he discovered that by exposing silver coated copper plates for shorter periods, the faint latent image that was captured could then be chemically developed into a distinct visible image. Daguerre named the process after himself and the Daguerreotype was presented to the general public in 1839. Negative/Positive – Three weeks after the Daguerreotype made its debut, British scientist Fox Talbot reported that he had devised a “photogenic drawing” process — which he had already been experimenting with for several years — based on the use of light sensitive paper as opposed to metal plates. Talbot would eventually — and accidentally — discover that a short exposure time and the right chemicals turned his paper into a negative that could be used to make multiple positive prints. Talbot called his process “calotype” and introduced it to the world in 1841. Roger Fenton: War Photographer – Roger Fenton rose to fame in England during the “golden age” of photography in the 1850s. Originally recognized for his architecture and landscape photography, Fenton was dispatched to cover the Crimean War in 1855, thus becoming the world’s first war photographer. Because of the unwieldy nature of his equipment and its inherent technological limitations, Fenton was unable to photograph moving subjects and instead focused on posed portraits and landscapes. He chose not to photograph dead or injured soldiers. Crossing the Niagara – On June 30, 1859, William England, chief photographer with the London Stereoscopic Company, gathered with 5000 other spectators to watch Jean Francois Gravelet (performing under the name Charles Blondin) attempt to cross from Canada to the United States by walking a tightrope suspended above the Niagara River. England captured Blondin’s successful 1100-foot (335-meter) trek across the river; his stereoscopic images were among the first to be licensed for international commercial use. The Roll Standard – In 1889, a year after introducing a simplified camera suitable for the general public (the Kodak Number 1), George Eastman transparent roll film made of nitrocellulose. Later that year, Thomas Edison took Eastman’s 70mm Kodak film roll, slit it down the middle, and cut transport perforations down both sides. This 35mm format would become the international standard for motion picture cameras and, eventually, still cameras. Stark Realism – Reinhold Thiele is often cited among the founders of photojournalism, having covered major events in Britain including the opening of the Tower Bridge and Queen Victoria’s Diamond Jubilee. In 1899, the London Daily Graphic commissioned Thiele to cover the Second Boer War. Many of the photographs made by Thiele were considered so graphic that the newspaper refused to run them. 35mm – German engineer Oskar Barnack had a problem: he was an avid amateur photographer who had become disillusioned by the weight of the photographic equipment of the time, an issue that became increasingly significant in light of Barnack’s failing health. His goal was to design a small, portable film camera. 35mm film was already in regular use for motion pictures; in 1913, Barnack developed the prototype of a camera designed to make use of 35mm film for the purpose of still photography. In 1925, the Leitz camera company began marketing the first portable 35mm camera under the trade name Leica. Cameras could now be taken anywhere and photography became even more accessible to the general public. Instant Gratification – In 1947, American physicist Dr. Edwin Land invented a one-step process for developing and printing photos by applying the principle of diffusion transfer, which reproduces the image captured by the camera’s lens onto a photosensitive surface serving as both film and photo. 57 of Land’s cameras went on sale before Christmas 1948 and thus the Polaroid instant camera revolution was born, with Ansel Adams as one of Polaroid’s greatest proponents. The Decisive Moment – Widely considered to be the father of modern photojournalism, Henri Cartier-Bresson’s work revealed the lofty potential of street photography. In 1947, after escaping a German POW camp four years prior, Cartier-Bresson teamed up with four other photographers, including famed wartime photojournalist Robert Capa, to form Magnum Photos — one of the world’s premier photo agencies. His 1952 book The Decisive Moment is a powerful testament to “the photographer with a heart” and an amazing record of 20 years’ worth of work from one of the world’s greatest documentary photographers, who was intent on revealing both tragedy and triumph in all its forms. Cartier-Bresson documented the Spanish Civil War, the Chinese Revolution, and George VI’s coronation; he captured such personalities as Truman Capote, Gandhi, Marilyn Monroe, Sartre, and Che Guevara. 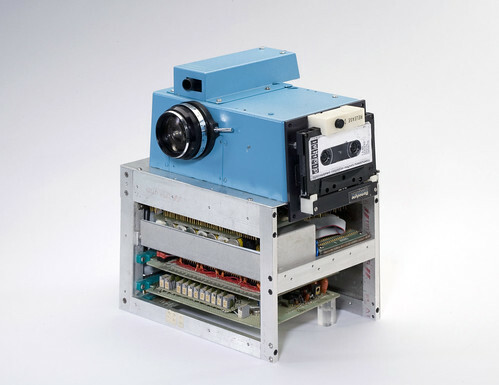 Digitize Me – In 1974, Gareth Lloyd, a supervisor at Kodak, presented electrical engineer Steven Sasson with a question — he wanted to know whether a type of high speed semiconductor known as a charge-coupled device (CCD) could be used to fashion a camera image sensor. A year later, Sasson had invented a big blue contraption that could capture an image, convert that information into an electronic signal, then digitize the signal and store it in memory. This first digital camera, which weighed 8 pounds (3.6kg), captured a black and white image with a resolution of .01 megapixels. It took 23 seconds to record the image onto the storage medium — a cassette — and an additional 23 seconds to read the image and display it on a television screen. Sasson received the National Medal of Technology and Innovation in 2012. The Death of Film? – Building upon Steven Sasson’s landmark invention of the digital still camera, Kodak released the first commercially available digital SLR in 1991. Known as the Kodak DCS-100 it was essentially a modified Nikon F3 body equipped with a 1.3 megapixel sensor and an external storage unit with a capacity of 200 MB, capable of storing 156 uncompressed images. The DCS-100 wasn’t an overwhelming commercial success; sporting a retail tag of $13,000USD, it sold 987 units. More significant, however, was that it marked the inevitability of the dominance of digital photography.